Can I Get a Credit Card The Same Day I Apply? In this post, I will be revealing the best credit card companies where you can get the credit account approved instantly and get a credit card delivered overnight. This means that you can start spending on the account as soon as the new account is opened, this is usually the same day your credit card application is approved. AMEX is one of the best credit cards if you want your credit card account today. Amex delivers it's credit cards automatically overnight and they will even deliver the credit card on a Saturday. Also, another interesting point worth noting is that you can sometimes use the AMEX Credit Account through the AMEX checkout and the transaction will go through, this is not guaranteed but it's worth a try if you need the money quickly. If you want an instant credit card approval with a number, and want to use it today you could try Bank of America. The card you should apply for is the Bank of America Alaska Airlines Visa Signature Card. You can find this by doing a search on Google for the credit card application website. 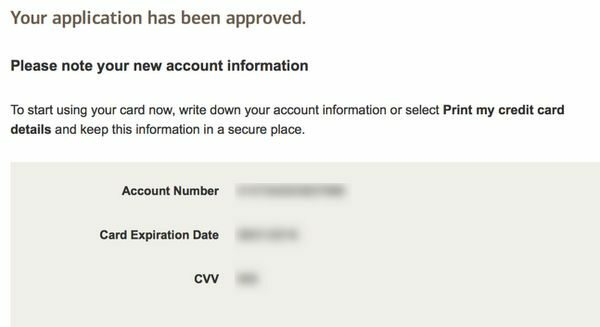 If you approved for the credit card your will get your account information and you can start using the card straightaway as shown below. It's like an instant virtual credit card. Sometimes, the account number, card expiration date, and CVV are not given instantly. When this happens just call of Bank of America and ask them to provide you with these details over the phone. If you're prepared to pay a fee for an immediate credit card you could try applying for a Barclaycard Arrival Plus World Elite Mastercard. For a $30 dollars fee you could have the card sent overnight. If you want the credit card within 2 days you can also pay a $15 dollar fee. Some credit cards like the Barclaycard Arrival Plus offer a waived fee for sending out credit cards quickly. Another excellent Credit Card company is Chase. You can get the Chase Sapphire Preferred and the Chase Ink Plus sent overnight for free. After you are approved for the Chase Sapphire Preferred or Chase Ink Plus, just call customer services and ask them to send the card to you overnight. You should also ask them for the Account Number, expiry date, and CVV. Sometimes, Chase is happy to provide this information over the phone. If you want another credit card company which sends its credit cards quickly you should try Discover Credit Card. There are two cards, in particular, the Discover IT, and the Discover IT Miles. Both these credit cards are shipped quickly and come with other perks such as 10% cash back and double air miles for new members. If you can wait a little longer you should also try the US Bank credit cards. When you are approved instantly for the following credit cards you can call customer services to have them rushed shipped for 15 to 30 dollars. If you have bad credit and need cash fast you could try applying for credit cards from Aqua, Luma, and Capital One. Sometimes, all these credit card companies offer instant approval if you meet their minimum bad credit lending criteria. These credit card companies also offer direct transfer to bank account. What you have to do is call up all these companies which offer bad credit credit cards and ask them if they are able to ship the card overnight or offer an account number, expiry date, and CVV. You should also ask whether they offer direct transfer to a bank account so you can get the money quickly. If you have good credit and you apply to some of the credit card companies above you should be able to get the credit card the same day you apply. The trick is to apply for credit cards that offer instant approval and then call up customer service to have the credit card sent earlier or the details given out. This process has worked for many people and it could work for you.